Colors: red, navy blue, yellow (2), maroon, aqua blue (greenish tone), light green, ivory, dark brown. Design: The field with its red ground has several rows of large eight-pointed stars. The weaver, though, has altered the motif, drawing the stars together into a long central strip, so that the individual stars can no longer be recognized. The basic shape can be seen in the small eight-sided stars in the octagons with the differently coloured ground distributed across the rest of the field. The border represents heads of birds of prey (raptor). Birds of prey are considered as ongon between Turkic people (each clan has a different totemic bird). The rug is fascinating in the arrangement of its motifs and the expressive force of the colour. The presence of the double-headed animals makes the rug an 'animal carpet'. 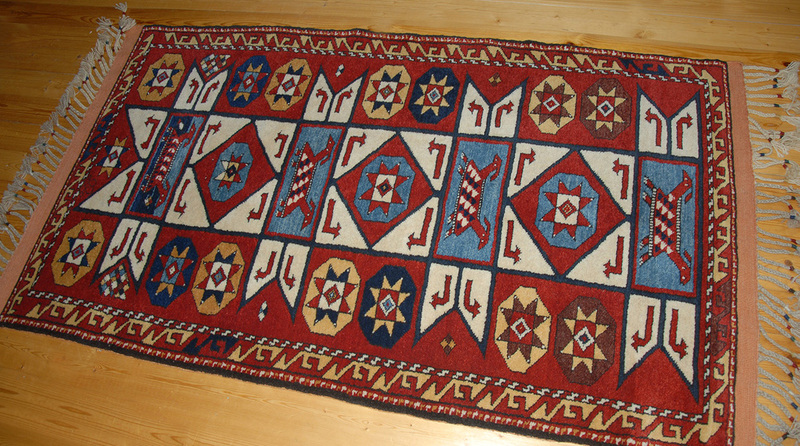 The above historical rug was acquired by Wilhelm von Bode in 1885. In 1909 it was transferred from the Kunstgewerbemuseum to the Kaiser-Friedrich-Museum. It was rediscovered in 1982, in the course of a reappraisal of the Turkish carpets by Friedrich Spuhler.